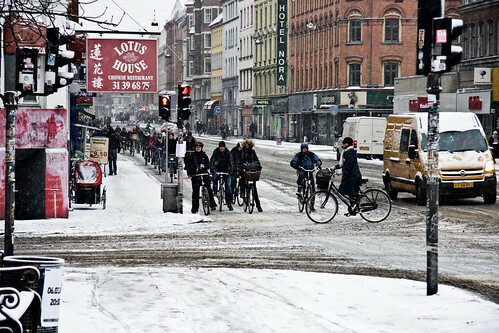 The snow continues to fall in Copenhagen but the bicycles continue rolling. 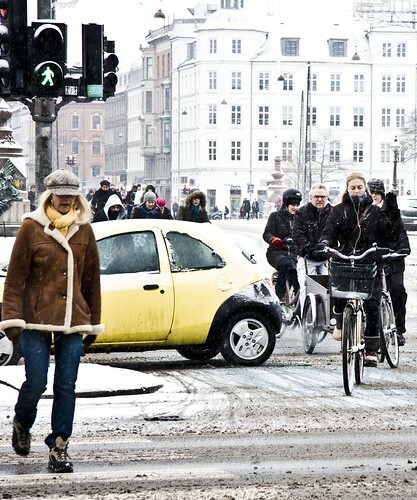 This is Nørrebrogade, the busiest bike street in the nation. You can see that the morning bicycle rush hour, while thinned out a bit, is still respectable. 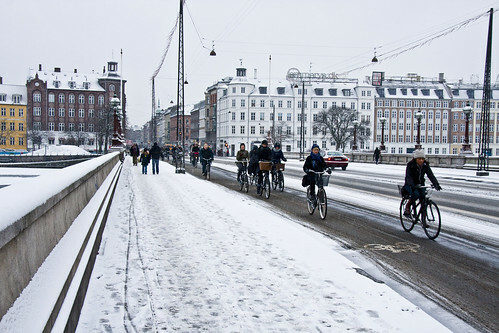 Bicycles crossing Queen Louise's Bridge. Quite often you witness a little traffic jam when some cars don't make it over the intersection. But when the bike traffic lights turn green, there is little mercy. Often cars are stuck in the intersection while hundreds of bikes roll past, unaffected by the car's fate. Flowing like a river in front and behind the car. I love it when that happens.